CM: Heinrich Kautsch's In Labore Qvies (In Work Rest) is a bronze plaquette that represents a woman meditating in a library. The woman is sitting in a comfortable armchair on the right, leaning on a writing desk against bookshelves, her right hand holding a pen and her left hand supporting her pensive head. The Latin motto "In Labore Qvies (Quies)" means that in good work can be found the true rest of life. The exact date of this plaquette is not certain, but the mould was used on many an occasion, even after Kautsch's death in 1943. The earliest known In Labore Qvies plaquette was dedicated to the Austrian economist and social theorist Victor Mataja (1857-1934) in 1911 and is kept at the Musée d'Orsay in Paris. 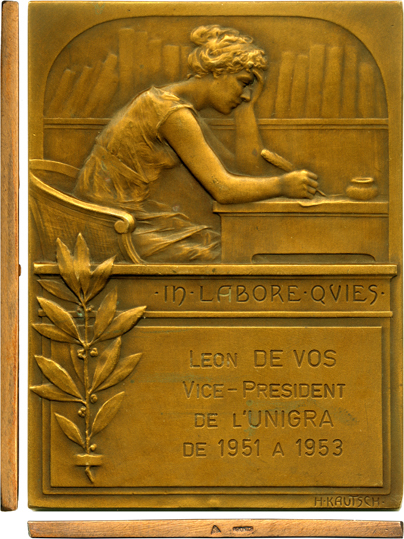 The present In Labore Qvies plaquette is a posthumous production, bearing a dedication to Belgian painter Leon de Vos (1897-1974) to commemorate his term as Vice President of UniGra in the period from 1951 to 1953. A subsequent In Labore Qvies plaquette was dedicated to German proprietor M. Charles Mayer in 1955.